Looking for free parking in NYC? We’ve done the research for you. Check out these five tips below. The Big Apple has tons of things to do for tourists and residents alike, but parking sure can be stressful. No one wants to waste their time circling the block or paying too much for a valet to park your car. Believe it or not, you can find free parking in NYC. We rounded up our top free parking tips below, plus a bonus tip on how to reserve a parking spot in the city. The New York City government passed an ordinance in 2005 that allows for free street parking on Sundays on any street parking meters. Whether you’re visiting from out of town or a resident driving within the city, this is something you can definitely take advantage of on the weekends. We’re not saying it will be easy to find street parking, but it’s good to keep in mind on Sundays. On major legal holidays, standing and alternate side parking are allowed unless there are signs that say otherwise. The major legal holidays include New Year’s Day, Memorial Day, Independence Day, Labor Day, Thanksgiving and Christmas. But be aware, these spots will be hard to find during busy holidays. If you want to guarantee your spot ahead of time, you can use an app like SpotHero to reserve a parking spot in advance. Some signs have indicated hours when you cannot park. However, anytime before or after those indicated hours is fair game. Make sure to read signs closely like this one below. With a little research, you can actually see ahead of time what parking signs are on the streets near your destination. Search the Department of Transportation’s map of parking signs to determine if there’s no parking during certain times. For example, the map below shows that there’s no parking on Wooster St between Houston and Prince, Monday – Friday 8am-6pm. That doesn’t mean parking will be easy to find in the off-hours, but it could be worth a shot. If you know the exact borough name, street name, and cross streets you’re heading out to, you can look up what the parking rules are at that location. 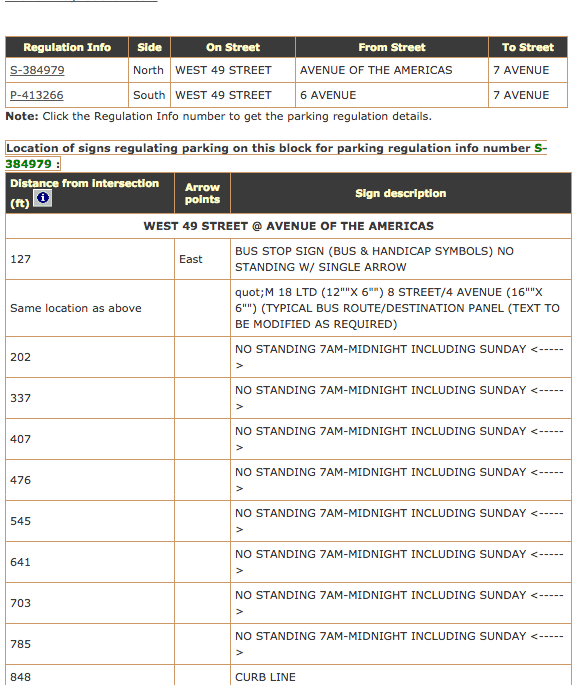 For example, here’s a look at parking regulations in Midtown near 49th St. between Avenue of the Americas and 7th Ave. If you’re willing to drive around a bit, you may be lucky enough to score free parking that way. Check out New York City Parking Regulations here. New York City has a couple of hotels that offer free parking. 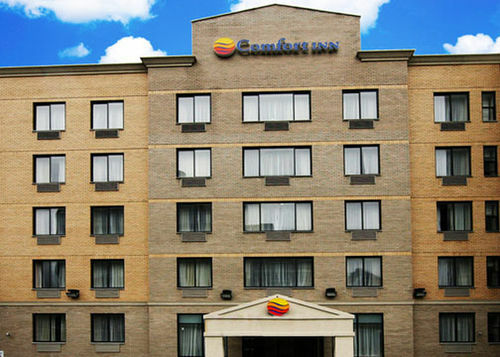 If you are staying at Comfort Inn Sunset Park or Hotel Cliff for a few nights, take advantage of the free parking. Then use public transportation to get around the city to see the sights. For more information on those hotels with free parking, click here. If you’re going to park for more than two hours in the city or having trouble finding free parking around New York City, check out SpotHero. SpotHero is an app that helps you find and reserve parking in hundreds of garages and lots around New York City. Visit the SpotHero website, or download the app (iOS | Android) to book your parking reservation. Explore more affordable New York City parking by clicking on the map below.